Maliha Abidi is a Pakistani author, illustrator, and medical neuroscience student in the UK who recently penned a book of more than 50 women’s stories—from pilots to astrophysicists to humanitarian workers—who all hail from the same nation: Pakistan. 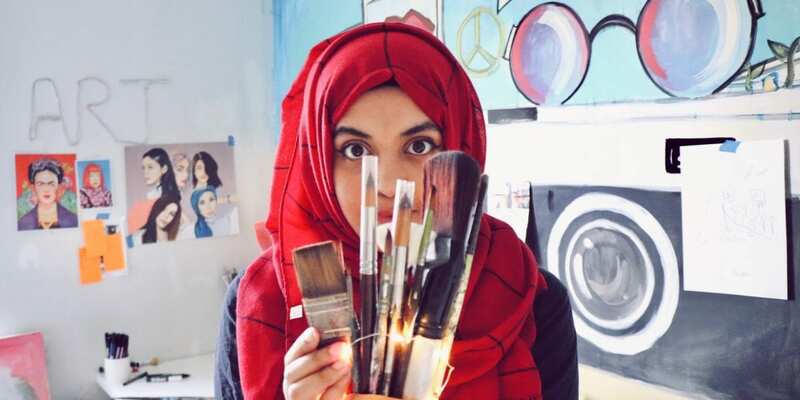 Abidi has spent more than a year researching and depicting inspiring women of Pakistan, and as a result, she has become one herself. Unearth Women (UW): How did you decide on which women to feature in your book? Maliha Abidi (MA): More than 50 women who are part of this book were selected for many reasons. The list could easily be full of thousands of women, but I wanted to select the best stories that set new standards for women everywhere, across many fields. I wanted to show what Pakistan is for women. People often consider my land a poor country where women do not have many rights. I wanted to bring together stories in the name of women’s empowerment and feminism to answer those assumptions, as well as make Pakistani people confident in the potential of their own country, and show how these women can achieve so much while being Pakistanis. 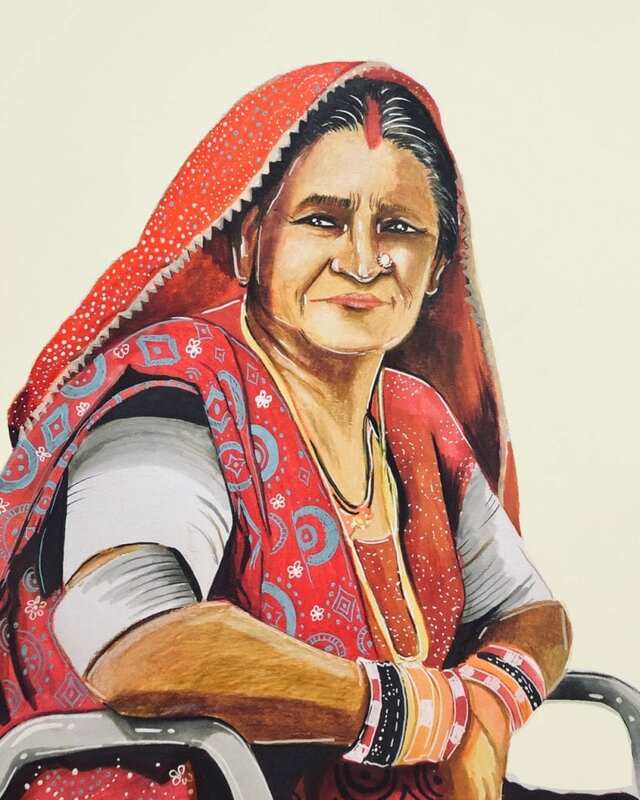 Maliha Abidi’s illustration of Veeru Kohli, a Pakistani bonded labour and human rights activist. UW: Beyond illustrations, what writing will your book include? MA: The writing is basically a little biography and a look into these women’s lives and how they got to change their lives while inspiring others. It includes their achievements, struggles, and strengths. UW: How do you hope this book will influence young women? MA: I hope that young women, especially in Pakistan, see that these women belong to the same land as they do. Regardless of any discouragement they may face, I hope they remember the struggles these women went through. I hope every young woman reading these stories apply the Pakistani women’s spirit to their daily lives as they strive to achieve their goals. 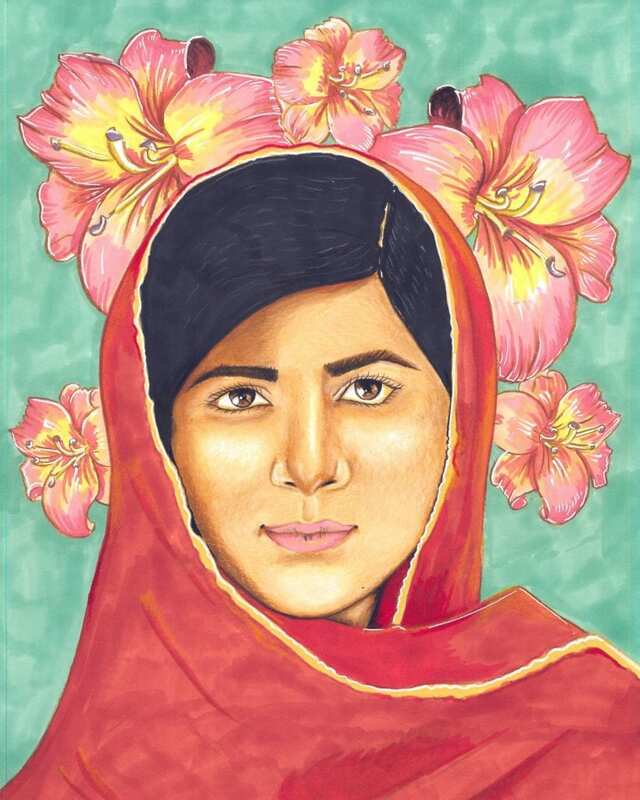 Maliha Abidi’s illustration of Malala Yousafzai, a Pakistani activist for female education and the youngest Nobel Prize laureate. UW: You partnered with UN Women Pakistan for a campaign against Pakistan’s dowry system. How do dowries negatively impact women? MA: Dowry is something that many people take out of context. People confuse this cultural practice with religion and use that excuse as leverage, whereas dowry in Islam is very different than the cultural beliefs of it. It violently impacts thousands and thousands of women around the globe. The problem is deep and feeds off society’s pressure to show off wealth. Sometimes, girls are beaten in the name of dowry, or told that their families didn’t do enough. There are many levels to this issue and, when trying to solve it, you are constantly faced with one issue after another. We have a long way to go before we solve this problem but for now, we must not stop talking about it because that is what will make people think over the consequences. 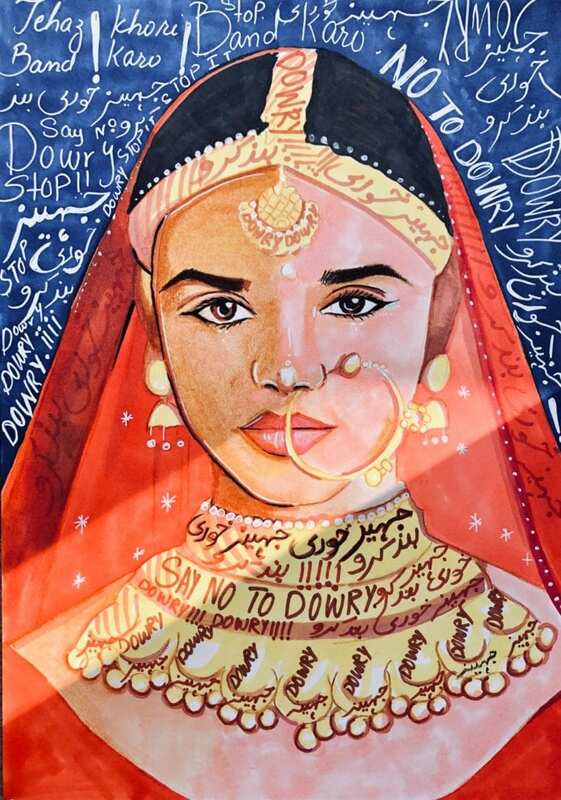 Maliha Abidi’s’ drawing for a dowry campaign in partnership with UN Women Pakistan. UW: What does being a feminist mean to you? MA: Being a feminist has one meaning for me, but with two steps of completion. Feminism is a belief where you want equal rights for women, and the second bit is to take action for those beliefs. It is not enough to think about it or just have these values. As we all have heard and know, actions speak louder than words, so feminism to me is taking action for women’s rights and standing up for equality. There are many misconceptions revolving around feminism. I think that if everyone understood it, they would be for it, but I guess it has become like a piece of art. Viewers have their own perceptions of it. 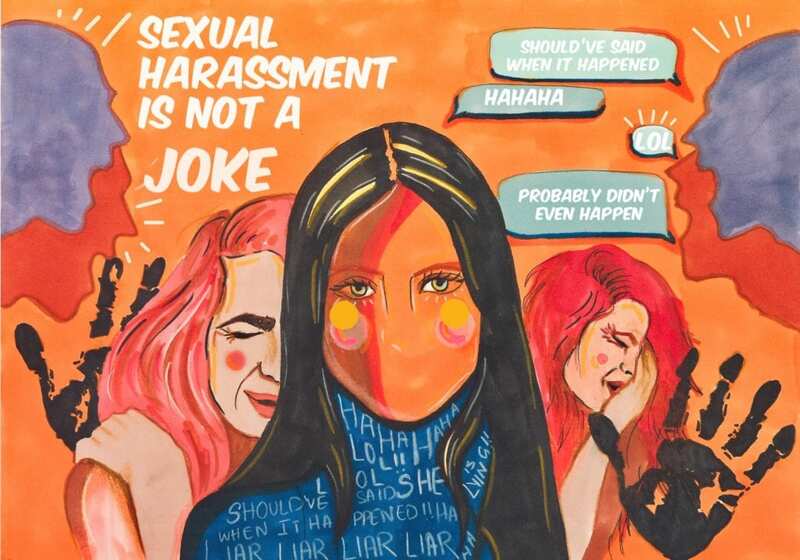 Maliha Abidi’s illustration inspired by the #MeToo movement. UW: How can your project be relatable and motivating to women from other countries? MA: Women around the world face challenges similar to one another. The Pakistani women in my book made a name for themselves outside of Pakistan, as well, so they didn’t just inspire women in our country but outside of it, too. It is also relatable because women’s empowerment comes first as a theme in the book. It is meant to speak to you on an empowerment level and it doesn’t matter what country, what gender or what religious background you belong to, these stories represent strong, fearless and brilliant women who faced many struggles and still achieved their goals. 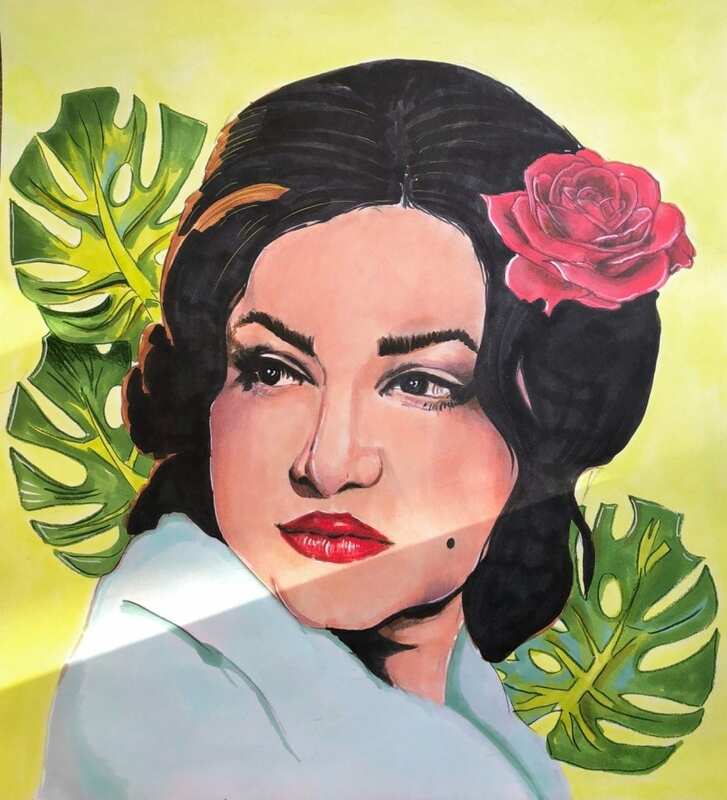 Maliha Abidi’s illustration of Malka e Taranum, also known as the Queen of Melody, who was a celebrated Pakistani singer and actress. UW: You dedicate the book to your grandmother. How has she been influential in your life? MA: As humans, we go through many struggles in our lives; that is just part of being human, but my grandmother was always positive. She had a beautiful smile. She motivated me, always taught me to be kind and taught me what it means to be myself. She passed away from cancer in 2012. I never saw her make excuses for anything, she was always very independent and never relied on anyone. Even thought my grandparents had a beautiful relationship, I saw them both give each other respect and space. If she needed something from the market, she would go herself. I saw her be a kind neighbor, considerate friend and the best mother. These things may not be a big deal in today’s fast paced world but when I was growing up, seeing these things empowered me, which is why I consider her to be the strongest woman I know. 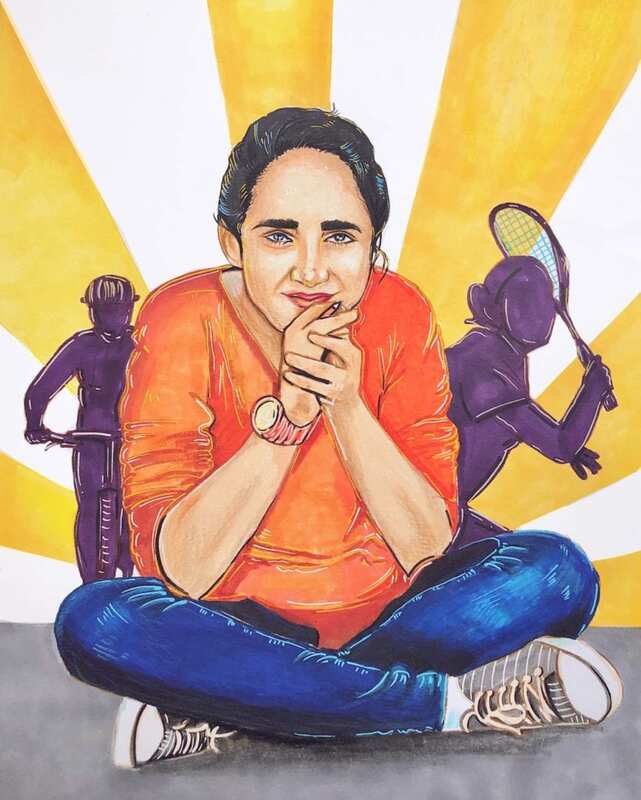 Maliha Abidi’s illustration of Noorena Shams, a Pakistani sportswoman who is a respected cricket player, squash player and cyclist. UW: What’s next for you in your career as an artist? MA: I will keep creating for the things I believe in but there is another book in the works. It is also focused on women’s empowerment but is meant to be about women from across the globe. I am very excited to have worked on Pakistan for women and am so looking forward to finishing work on the next book, too. It will be announced in August 2019. Abidi’s book is the first of its kind in Pakistan.